1. Cash prizes for bad corporate citizenship. The urban world is all abuzz, handicapping the city vs. city vs. city race to land Amazon’s HQ2, a rich prize of investment and jobs. Amazon’s request for proposals asks cities to sweeten their bids with an array of tax breaks and other subsidies. And while 50 (or more) cities are likely to respond, its almost certainly the case the Amazon already has just one or two candidate locations. The high profile beauty contest is less about generating more information about possible locations, and more about giving the company the strongest possible leverage to extract concessions from its preferred location. Aside from the obvious importance of a city that has a strong talent base (and the quality of life to attract even more talented workers), the Amazon RfP tells us less about corporate location requirements than it does about corporate cynicism when it comes to public finance. 2. Cities are leading in national income growth. We got some good economic news this past week. Annual tabulations of census data show that median household income is up and has fully recovered, in inflation-adjusted terms, from the effects of the Great Recession. More good news: Poverty rates have fallen by almost a full percentage point in the past year. And income growth has been fastest in the nation’s cities. 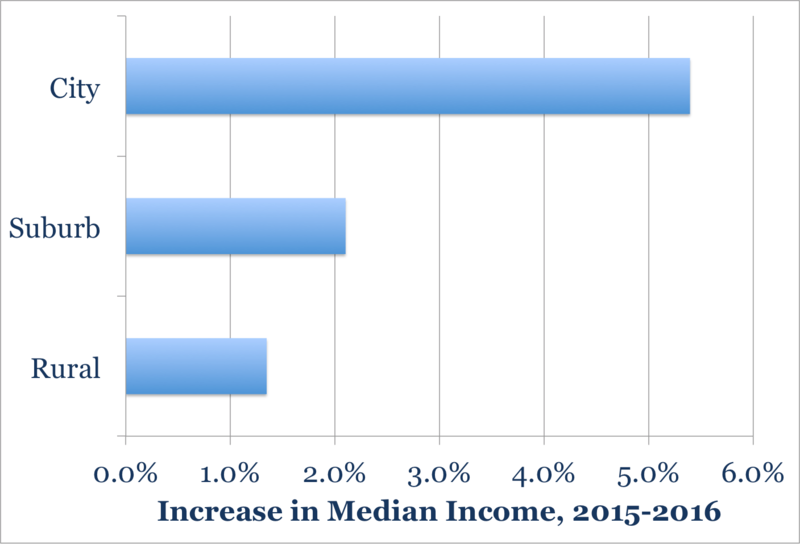 City incomes grew by 5.4 percent in 2016, more than double the rate of income growth in their surrounding suburbs. This is more evidence that US economic growth is increasingly powered by what’s happening in the nation’s urban centers. 1.How local housing regulations hurt the national economy. Writing in The New York Times, Chang-Tai Hsieh and Enrico Moretti summarize the results of their research on the connections between city size and economic productivity. Some cities are far more productive than others, and the limits on housing supply in those cities not only constrains their growth (not to mention driving up housing prices) but also lowers the overall productivity of the US economy and tends to decrease economic opportunity. They estimate the national economic cost of local housing regulations at about $1.4 trillion annually. 2. An instant experiment in pricing and road demand. Earlier this month, the new government of British Columbia abruptly ended tolls on its multi-billion dollar Port Mann and Golden Ears Bridges. In the space of a few days, traffic levels on the bridges jumped more than 20 percent. Although its a crazy policy change–and leaves a gaping hole in the budget for these projects, that will have to be subsidized by non-users–it shows just how dramatically and quickly traffic levels respond to changes in prices. 3. Portland community activists fight a freeway widening project. The Portland Mercury describes the unfolding battle over a plan to spend nearly half a billion dollars widening a mile long stretch of Interstate 5 through Portland.